According to Cramer, the ideal “insurance” for your savings is gold. Why does Cramer argue that gold is so important? “Because gold has some special properties that makes it precious to any diversified portfolio.” Due to an extremely high demand for gold in the market and the difficulty in taking the metal out of the ground, it is and will continue to be scarce. So it will always be valuable. In fact, “Gold tends to go up when everything else goes down,” so it can protect your savings against geopolitical events, uncertainty and inflation. Many people will point out that gold has not done “anything spectacular” in the last few years. This may be true, but look at it this way – your car and home insurance aren’t expected to increase in value over time, because they serve a different purpose. The real purpose of insurance is protection; not gains. As you think about your insurance, Cramer argues, so should you think about your gold and not speculate on the rise and fall of its value. Why invest in gold and not in gold mining stocks? Surely, people who take out the metal out of the ground should also be quite sought after. But every time he’s invested in gold stocks, Cramer claims to have been burned. Why? It’s because of “the same thing that makes gold valuable… its scarcity.” It is extremely difficult to find and mine it. Gold miners also face a host of other challenges quite unrelated to the availability of gold. Political uncertainties, conflicts and even wars continue to plague some gold producing countries, making their task more difficult. “Plus gold miners can screw up things in countless different ways.” They have debts, they have management issues, and often the gold mining stocks usually go down even when the value of gold increases. 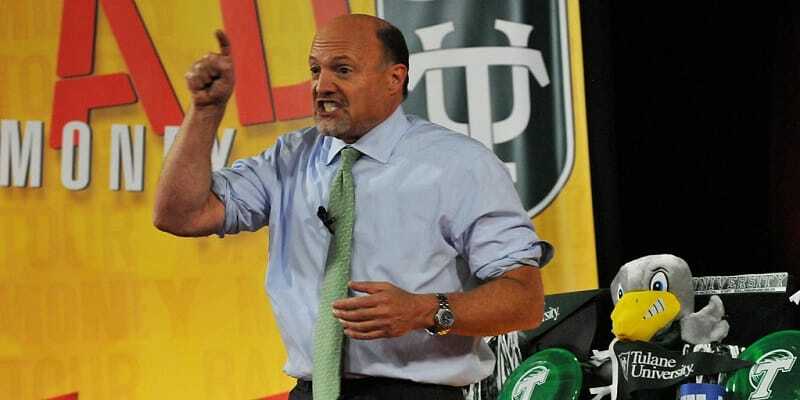 So what does Cramer advise? Instead of investing in a multitude of stocks, concentrate only on ten to fifteen high yielding stocks. And make sure that a significant amount of your investment is in gold. The world has just come out of a recession. And no one can predict when the next one is due – in the next week or decade. In uncertain times like these, it is good to have a certain element in your portfolio that you can depend on to be rock steady no matter what. Gold therefore becomes the best option. Have you started to follow us on Google+ yet? If not, click here to do it today.